We like to share, We love to hear from you . . .
It’s a GWdesign news online magazine dedicated to all our fans out there, but also geared towards all the home lovers. Our publication brings you the latest news, reviews, photos and every other little bit of interesting information from the GWdesign world. If you would like to contact GWdesignBlog with suggestions, comments, corrections, or tips, please contact us. Atoll the new sofa from B&B Italia combines superb line, execution and comfort. We have the honor to be featured in this superb publication with two projects. 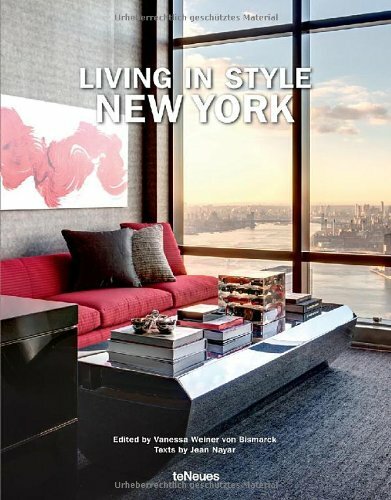 Living In Style New York presents a collection of twenty of the most stunning residences in New York and the inspiration behind them. Thank you for contacting GWdesign. We appreciate you take the time to write us. We will get back to you promptly. If you have an urgent matter, please call us at (310) 954-0064. You may reach us Monday to Friday between the hours of 9 AM and 5 PM (PT). Be Original . . .
We joined BeOriginal. Committed to initiating discussion on the importance of preserving original design across North America through information, education and influence. GWdesign is proud to be a member of BeOriginal Americas, in the fight against counterfeit design. When I met you in the Summer . . . This is an interesting place in Jersey City, NJ. A massive warehouse complex of gallery spaces, artist studios, and few shops run by this organization. Essentially a storage facility for art. They are the archivist for Pritzker Winning architect Richard Meier. The model of the Getty Museum in Los Angeles and the project for the new World Trade Center are in a permanent showcase, which house most if not all his archives. State of Art Metal work company with technical experience. Serett, founded by Joshua Young and masterfully managed by Zach Cooper provide us with exquisite craftsmanship to suit our design theme and budget. They ship for us all across the country. A Real Estate Broker who not only knows his field, but has the talent and gift to understand clients needs and requests. It's a great sense that identifies a real professional. Meet Bryce Lowe. The incredible BMW 850csi Art Car designed by David Hockney at the Paris Photo International Art Fair. On the fantastic Paramount Studio in Los Angeles, such a wonderful piece of art & design. On January 6th 2014, GWdesign is proud to announce the official opening of their Los Angeles Office in West Hollywood. Now from the East to the West Coast, we work on projects ranging from Residential to Retail, Restaurant and Corporate. While finishing our recent restaurant project in New York City, we followed Miami native, Artist Wallace Lebrun putting the last touch on this giant painting. All the work was done in his Brooklyn Studio, with the last details executed on site. It was amazing to see some visitors and people walking by, curious to discover a master piece being finished "live" in front of their eyes. So meticulous, it's a real pleasure working with this extremely talented artist, and feel the love he has for his passion. With brilliant photographer Dana Meilijson and her crew from the German publishing house teNeue, we start the photoshoot at one of our latest projects in New York City. A wonderful duplex in the charming neighborhood of Gramercy Park. Under the heat wave hitting New York City, Landscaper and designer Billy Diggs keep his cool working on the vertical garden. This large piece was a focal point of this East side balcony overlooking Gramercy Park. The green wall includes a waterfall and a small pond.